20 of our students sat the United Kingdom Mathematics Trust (UKMT) Intermediate Maths challenge in February 2019. The Mathematical Challenges aim to stimulate mathematical problem solving, and consist of 25 multiple choice questions. The top 40% of students nationwide receive a Bronze Certificate, the top 20% of students nationwide receive a Silver Certificate and the top 7% of students are awarded a Gold certificate. 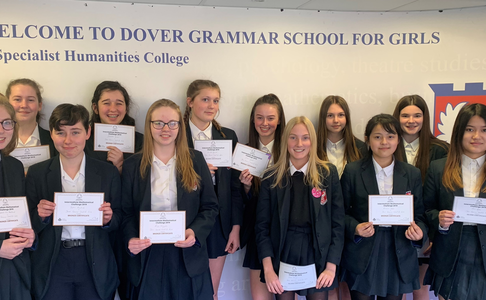 We are very proud to announce that 10 of our students won a Bronze level certificate, 3 won a Silver level certificate and one student, Faye Martin, won a Gold level certificate. Faye also achieved highly enough to be entered into another round of the competition, called the "Pink Kangaroo". Congratulations to all those who took part, especially our certificate winners!